It is not fun to go and print something out only to notice that it didn't print out right. One of these problems is when light prints on the side of the paper. There are usually two scenarios where this can happen and it usually depends on what kind of toner cartridge the printer uses. If your printer's toner cartridge uses both the drum and the toner in a single unit, like many HP toner cartridges, then the problem is most likely caused by the cartridge itself. When the cartridge is the likely cause of the problem, it is probably because the toner is not in its slot correctly. Light is then printed onto the paper because one side of the cartridge is installed correctly into the slot while the other side is not. It might be too far away from the paper while the printer is printing and this is how the light is printed on that side. The best way to test for this problem is by powering down the printer. Remove the power cord from the wall or the printer as well. Next, open up the access panel of the printer. This will either be on the front or the top of the printer to expose the cartridges. Remove the cartridges and then reinsert them correctly according to the manufacturer's instructions. Once you have reinstalled, turn the power back on and see if this fixed the problem by printing a test page. Another problem that causes light prints on the side of the paper is the drum itself. If your printer uses a separate imaging drum from the toner, then the drum is most likely the cause. In these types of printers, the laser toner is first transferred from the cartridge to the drum. Then the toner is transferred to the page that is printing. If the drum is dirty, oily or scratched, this could be the cause for light printing on the side of your paper. If the cause is your drum, it is best to replace it or have it cleaned by a professional. It is a sensitive part of your printer and it is not recommended to try and clean it yourself. Doing so can result in breaking it or causing damage to your printer. There are many printer options that can change the entire look the paper you are printing. Learning how to change the printer’s settings is easy, but no one has to know that. It can be your little secret. The first step is to prepare the document for printing. Once the document has been typed and checked for errors, it is time to print it for use. First click on the ‘print’ button in whatever program you are in, select your printer from the drop drown and click the Properties or Preferences button. Click on the ’printer setting’ tab. This opens a menu with a variety of choices. The next step depends on what you want to change on the document. Documents can be set to print at differently levels to save on ink or toner usage. Included are ‘draft’, ‘normal’, ‘best’ and ‘maximum’. These settings determine the DPI setting. The higher the setting, the better quality of print received. Click one of the buttons depending on which one you wish to use. A ‘draft’ copy will not use nearly as much ink or toner and the printing will be much lighter than the other settings. Use this if you just want a test run. ’Normal’ prints a quality copy that is geared for primarily text documents. The ‘best’ setting gives the best possible printing job. When using this setting, printing will take longer. If printing images, this setting gives the best outpu. The last setting is ‘maximum’. This setting puts the maximum amount of ink or laser toner on the paper and is generally not useful. ‘Orientation’ on a printer means which way the document is printed. If it is a letter, the paper should be printed in ‘portrait’ mode. If it is a graph or chart, ‘landscape’ works best. To change the orientation, click on ‘preferences’. Click on the scroll down button, and then choose the option you prefer. Click the ‘save’ button and the orientation is set. The number of copies you want printed can be changed from the first printer screen. It is on the lower right corner of the screen. You can use the scroll button to change the numbers up or down. The number can be typed in as well, which is sometimes much easier. This setting automatically returns to 1 after the requested number of copies have printed. If there are certain pages you want printed but want to leave out others, you can simply change the page range. If you want all the pages to print, you don’t have to do anything. If you want to change the range, mark ‘pages’. The page numbers must be typed in. For instance, if you want page 2-5 printed, type 2-5. To print on particular page, type in that page number. To print page one, type 1. These few changes make it much easier to manage printing tasks. You will save ink¸ paper and time. All print jobs will come out more professional in appearance, which makes you appear more professional. When a new toner cartridge is opened for a printer, it should have a shipping seal. This is usually a strip of plastic that is wrapped around a main roller in the cartridge. It will have a little tab sticking out from the cartridge. Prior to using the cartridge, this tab must be pulled, thus removing the seal. Otherwise, the toner will not come out and your prints will be blank. Just as it is important to make sure a jar of peanut butter has a proper seal before it is opened, a toner cartridge must have a seal. If the seal is lacking, return the cartridge for a replacement. The seal wraps around the main roller in the cartridge which creates a gap between the application rollers, developer and doctor blade. This prevents any toner from being released and allows the cartridge to be shipped. If the seal was removed or there was a problem installing the seal during the manufacturing process, you will immediately know because laser toner powder will have dumped out into the plastic bag during shipping. Another problem that is common with the seal, you are unable to pull the seal out of the cartridge. I have seen this issue happen on a number of occasions with brand new genuine HP toner cartridges. If the seal is jammed, do not continue to tug on the seal. Instead, immediately call to get a replacement cartridge. The Playstation 3, beyond its primary function as a game console, is an excellent all-in-one multimedia device. It's one of the top Blu-ray players on the market, and can read virtually any movie file, music file, or, particularly, high resolution image files. However, a feature that is not so widely utilized is the PS3's ability to print images directly from its hard drive. We'll explain, step by step, how to make this happen. First, you want to make sure you're using a printer that is compatible with the PS3. The PS3 supports HP, Canon, and Epson printers. You can usually check on the manufacturer's website to learn which printers are compatible, as well as Sony's website. Make sure your PS3 firmware is updated, as well. I have my PS3 successfully connected to the HP C4795 ink printer via a USB cable. Second, connect the printer to the PS3. You can either use a USB connection, or you can use a printer that is on your network. In this case, just make sure the printer is on. 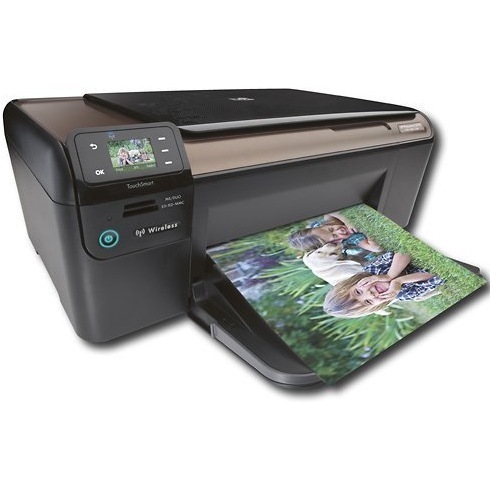 It's important to note that with some or all HP printers, the PS3 will not recognize them if they are connected via USB. You will have to have them connected on the same network to use them in this case. Next, you will need to configure the printer. This can be done in the XMB menu, by first going to Settings, then Printer Settings, then Printer Selection. The on-screen instructions should guide you from that point on. If this step is giving you trouble or you're not seeing your printer in the options, try selecting Other (Network Standard). This should provide you with a list of all printers that are available on the PS3's system network, where you should be able to find your model. At this point, you should be ready to print your images! This can be done by going to the Images category in the XMB, then selecting the image you want, pressing [Triangle], and selecting Print. It will then show your current print settings, which you can alter by pressing [Triangle] again. The settings can be different depending on the printer you're using. Select Print one more time and press [X], and your image will print. You can also print an image that is currently being displayed by pressing [Triangle] and going through the same steps. If you need to check the printer's status or stop a print job, this can be done by going to Settings, then to Printer Settings, then Printer Manager. Also, if you have images stored on a DLNA media server that is being used by your PS3, you will need to copy them to the PS3 hard drive before you can print them. This can typically be done by having the image selected and pressing [Triangle], then selecting the Copy option. This guide should make printing with your PS3 a breeze. If you need further help, check on the Sony website or the printer manufacturer's site, as they can provide more detailed information. Sometimes, an office’s printing set-up can become extremely unwieldy and difficult to manage. People running such an office may wish there was an easier way to manage all that printing to the variety of ink and toner cartridge printers. Thankfully, there is a way to accomplish this. This solution involves installing Citrix printing management services. By using a Citrix program known as XenApp, you can manage Citrix’s different services as well all the printers installed on a computer network. An important part of using Citrix to manage your printing is setting up policies that determine how this management occurs. To do this, the advanced configuration settings of XenApp need to be used. By altering these configurations, a person can change the policy settings for a network’s printers. In specific, something known as CUP, an acronym that stands for Citrix Universal Printer, must be set-up and enabled. Inside this menu, there should also be an option labeled as “Policies.” Right click on this. You should now be able to see an option that is named “HDX Plug-n-Play.” You should click on this. Once you have done so, click to choose the option that is named “Printing” as well. Next, click on the option labeled “Legacy client printers.” After you have done so, make sure to click the selection named “Enabled.” The next option that should be chosen is the one that allows you create something called a dynamic session with private client printers. When you see this option, click on it. There should also be yet another option labeled “HDX Plug-n-Play.” Choose this option by clicking on it. Near by, there should be an option named “Printing.” Choose it as well. There should also be a “Sessions Printer” section that can be clicked on. Do so and then choose the “Enabled” setting. Lastly, you need to make sure this plethora of different settings and configurations is saved. You can do this pressing on the button labeled “Apply,” which should be located near the bottom. Once you have done that, click “Ok.” This will make sure all the altered configurations are indeed saved. Once you have finished all these steps, your printing policies with Citrix should be set-up. You can now use Citrix to mange your computer or network’s printing capabilities. What are printer firmware updates? Printer firmware is the program stored inside of a printer, which allows it to receive information from a computer and turn it into a printed image. Both ink cartridge and toner printers have firmware. While most users may not consider it important to install these updates, installing these updates can help repair bugs in existing firmware, which could reduce printer life. Many updates also fix issues with printing speed on some types of files and increasing the number of pages per minute that can be printed. Not all models of printers support user updatable firmware, so searching your printer manufacturer’s website for your exact model of printer will be required in installing firmware. Using a search engine, like Google, will often be the fastest method of finding the most up to date software possible for your printer. A typical search would consist of your printer brand + printer model + firmware. Once you have located the newest firmware, save it to your computer and hook up your printer. Be sure all cables are securely plugged in, as disconnecting the printer's data cable or power during the process may cause your printer to have an incomplete firmware installed, making it impossible to print until it can be repaired. This repair may require professional help, so double check before you begin the process. Run the executable file from your manufacturer, and follow all on screen instructions carefully. Most firmware updates will automatically detect your printer model correctly, but be sure to check twice when selecting any options during the installation process. Again, be sure not to disconnect any cables during the installation. Allow the firmware to fully transfer, and then restart your computer and printer to complete the process. Once your equipment has restarted, you can confirm that the installation was completed by entering the Control Panel on your computer and navigating to the Printers menu. Double click on the printer you have updated, and choose “Properties” from the “Printer” dropdown menu and check the version number in the “About” tab on this menu. The version displayed should match the version of the firmware you download. If it does, you have successfully installed your new firmware. If not, ensure that you have downloaded the firmware for your exact model of printer and try again.